A protocol for entorhino-hippocampal organotypic slice cultures, which allows reproducing many aspects of ischemic brain injury, is presented. By studying changes of the neurovasculature in addition to changes in the neurons, this protocol is a versatile tool to study plastic changes in neural tissue after injury. Chip, S., Zhu, X., Kapfhammer, J. P. The Analysis of Neurovascular Remodeling in Entorhino-hippocampal Organotypic Slice Cultures. J. Vis. Exp. (92), e52023, doi:10.3791/52023 (2014). Ischemic brain injury is among the most common and devastating conditions compromising proper brain function and often leads to persisting functional deficits in the affected patients. Despite intensive research efforts, there is still no effective treatment option available that reduces neuronal injury and protects neurons in the ischemic areas from delayed secondary death. Research in this area typically involves the use of elaborate and problematic animal models. Entorhino-hippocampal organotypic slice cultures challenged with oxygen and glucose deprivation (OGD) are established in vitro models which mimic cerebral ischemia. The novel aspect of this study is that changes of the brain blood vessels are studied in addition to neuronal changes and the reaction of both the neuronal compartment and the vascular compartment can be compared and correlated. The methods presented in this protocol substantially broaden the potential applications of the organotypic slice culture approach. The induction of OGD or hypoxia alone can be applied by rather simple means in organotypic slice cultures and leads to reliable and reproducible damage in the neural tissue. This is in stark contrast to the complicated and problematic animal experiments inducing stroke and ischemia in vivo. By broadening the analysis to include the study of the reaction of the vasculature could provide new ways on how to preserve and restore brain functions. The slice culture approach presented here might develop into an attractive and important tool for the study of ischemic brain injury and might be useful for testing potential therapeutic measures aimed at neuroprotection. The central nervous system is particularly sensitive to a loss or reduction of oxygen and glucose supply by the vasculature. Even a rather short interruption of blood supply to the brain can induce a permanent loss of function of the relevant brain areas leading to the typical stroke syndromes. In addition to the neuronal loss in the primary affected areas, there typically is additional delayed neuronal loss through secondary damage. Unfortunately until now, no neuroprotective treatment for the reduction of secondary neuronal death was available1. Research efforts for studying the mechanisms of secondary damage rely on the use of animal models of cerebral ischemia like middle cerebral artery occlusion and various thrombotic occlusion techniques (for a recent review see2). In parallel, also due to limitations and ethical concerns with the use of animal models, organotypic slice culture of various CNS tissues have been used that allow the study of neuronal reactions to various type of injuries3-5. For studying the neuronal reaction under conditions that mimic ischemic brain injury, the model system of oxygen glucose deprivation (OGD) has been developed. In this model, slice cultures are temporarily exposed to a medium that lacks glucose and has been equilibrated with nitrogen gas in the absence of oxygen. With such a treatment, it is possible to induce neuronal injury and loss which is rather similar to the one observed after ischemic injury in vivo6, 7. In the hippocampus, such a treatment induces neuronal loss specifically in the CA1, but not in the CA3 area or the dentate gyrus of the hippocampus. In contrast, the study of vascular reactions in slice cultures so far has not been widely undertaken. An obvious reason is the lack of circulation and blood vessel perfusion in the slice culture model. However, we have shown previously that it is possible to maintain blood vessels in CNS slice cultures for several days8, 9. The overall goal of this method is to not only monitor the fate of neurons after OGD but extend the study to the fate and remodeling of the vasculature which is an important part of the injury response. Until now such studies have required the use of animal experiments (De Jong et al., 1999; Cavaglia et al., 2001). In the protocol presented here, we will detail how such studies can be done in entorhino-hippocampal organotypic slice cultures challenged either with hypoxia or by excitotoxic lesions followed by analysis of both neuronal survival and blood vessel reactions. This protocol is based on a previously published study on this subject10 and can be useful for any laboratory interested in neurovascular interactions in the CNS. Animal experiments were carried out in accordance with the European Communities Council Directive of 22 September 2010 (2010/63/EU) and were reviewed and permitted by Swiss authorities. Prepare entorhino-hippocampal organotypic slice cultures (EHOSCs) from postnatal day 4 (P4) mouse pups using the static incubation method4,11. Here, use C57Bl6 and CB6F1 mice. Take approximately 30 min per mouse pup for the preparation of slice cultures, i.e., 3 hr for a litter of 6 mouse pups. Carry out all steps under sterile conditions in a laminar flow workbench with sterilized surgical instruments. 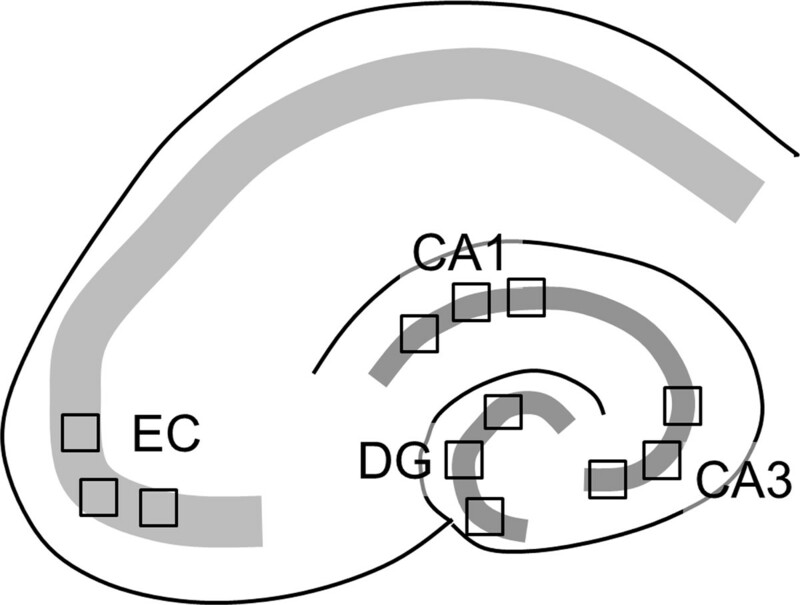 In order to avoid a possible interference from the position of the slice along the septo-temporal axis, use only hippocampal slices of the septal half. If not stated otherwise, carry out all steps at RT. Cut off the head of a P4 mouse pup with surgical scissors. No anesthesia is required for this step. Remove the skull around the brain and identify the fissure between the caudal end of the cerebral hemispheres and the midbrain. Carefully remove the part of the brain rostral to the midbrain from the skull and place it in ice-cold preparation medium consisting of MEM supplemented with a stabilized form of L-glutamine. Continue the dissection under a stereomicroscope with the brain being immersed in the ice cold preparation medium. Remove remaining meninges from the cortical hemispheres. Identify the hippocampus at the medial caudal surface of the hemisphere and separate it together with the adjacent entorhinal cortex from the remainder of the brain. Transfer the tissue to a tissue chopper and cut 400 µm thick slices under aseptic conditions transversal to the septo-temporal axis of the hippocampus. Place the slices on cell culture inserts (approximately 6 slices per insert) and incubate them in 6-well plates with 1 ml per well of incubation medium (47 ml MEM, 25 ml Eagle Medium, 25 ml horse serum, 1 ml glutamax I, 1 ml of a sterile 10% glucose solution, pH 7.3) in a humidified atmosphere with 5% CO2 at 37 °C. Change the medium the next day and then every other day up to 1 week. See Table 1 for an exact time schedule of the procedure. Culture EHOSCs for 5 days (DIV5) before exposure to hypoxia or OGD. At this time point switch the medium from incubation medium containing 25% horse serum to serum free medium with the following composition: Neurobasal medium with 2% B27 supplement, 1% glutamax and additional 0.1% glucose. Prepare the OGD medium as detailed in Reference 7 .The final concentrations of the components will be the following: 0.3 mM CaCl2, 70 mM NaCl, 5.25 mM NaHCO3, 70 mM KCl, 1.25 mM NaH2PO4, 2 mM MgSO4, and 10 mM sucrose at pH 6.8. Add 1 ml of OGD medium to each well of two 6-well tissue culture plates. Perfuse the OGD medium with N2 for 1 hr in a hypoxia chamber and then seal and keep O/N in an incubator at 37 °C. Use anaerobic strips as hypoxic indicators. Consider the medium to be oxygen free when the color of the strips changed from pink to white. For the induction of hypoxia, use serum free medium with glucose instead of OGD medium. Before use, perfuse the medium with N2 in a hypoxia chamber as detailed above for OGD medium. Before the slices are exposed to OGD, perfuse the OGD medium again with N2 for 30 min. Add 2 µl of a 1 mg/ml propidium iodide (PI) solution per well (for a final concentration of 2 µg/ml) to the slices for 30 min and select only healthy slices for experimentation as indicated by low numbers of PI positive cells. Use the schedule of OGD exposure and reperfusion indicated in Figure 1. Deprive slices of either oxygen only (hypoxia) or oxygen and glucose (OGD) for 15 min. For induction of hypoxia or OGD, transfer slices into OGD medium and keep for 15 min in the hypoxia chamber. Ensure that all fluids that remain on the sides of the insert are aspirated away when the cultures are switched from regular medium to OGD medium and back. After hypoxia or OGD, replace the OGD medium with oxygenated serum free medium and cultures are allowed to recover for 3, 24 or 48 hr in serum free medium in the regular incubator at 37 °C with 5% CO2. Add PI again prior to fixation for the determination of cell death. Culture EHOSCs for 5 days (DIV5) in incubation medium before exposure to pharmacological treatments. Start pharmacological treatments either during OGD or immediately after OGD when slices are transferred to serum free medium. Treatments for protection from OGD. Add 100 µM 6-cyano-7-nitroquinoxaline-2,3-dione (CNQX) or 1 µM tetrodotoxin (TTX) to the culture medium during OGD induction (for 15 min) or immediately after OGD induction for 30 min. Then, incubate in normoxic serum free medium for 48 hr before fixation. Treatments for induction of excitotoxic death. After 5 days in incubation medium switch cultures to serum free medium containing 100 µM (RS)-α-amino-3-hydroxy-5-methyl-4-isoxazolepropionic acid (AMPA) for 30 min. Remove the culture medium containing AMPA by aspiration (take care to remove any residual medium on inserts), then transfer the slices to fresh plates with normal serum free medium and keep them for 48 hr until fixation. Add PI for 30 min to the culture medium of living slices at a concentration of 2 µg/ml. View live cultures with an inverted microscope equipped with fluorescence optics and select slices for further treatments. For PI staining in combination with immunohistochemistry, add PI solution 30 min prior to fixation of the cultures. Remove the culture medium from the 6-well plate and add 3 ml of freshly prepared 4% paraformaldehyde (PFA) to each well. Then place the 6-well plate in a refrigerator and fix O/N at 4 °C. Remove the PFA solution the following day and wash the slices 3-4 times with phosphate buffered saline (PBS). Removal of the slices from the cell culture insert and blocking procedure for immunohistochemistry of free-floating sections. Carefully detach and remove the slices from the culture inserts using an art paint brush of the size 0 or smaller. Transfer each individual slice into a well of a 96 well plate filled with blocking buffer (PBS with 3% normal goat serum (NGS) and 2% Triton-X100). Keep the slices in the blocking buffer for 2 hr at RT under constant agitation by an orbital shaker. For labeling blood vessels use polyclonal anti-laminin at a dilution of 1:200 in PBS containing 1% NGS and 0.5% Triton-X100. For labeling neurons use anti-microtubule associated protein 2 (MAP2) at a dilution of 1:500 in PBS containing 1% NGS and 0.5% Triton-X100. Incubate the slices with primary antibodies for 48 hr at 4 °C with constant agitation. After the incubation period, wash them in PBS with 0.5% Triton-X100 for 3-4 times. Dilute secondary antibodies 1:500 in PBS containing 1% NGS and 0.5% Triton-X100. Incubate the slices for 2 hr at RT in the dark with the Alexa fluorophore conjugated secondary antibodies. Use the appropriate goat anti-rabbit or goat anti-mouse secondary antibody conjugated to Alexa 350 or 488. Remove the secondary antibody solution and wash the slices three times with Tris-buffered saline (TBS); mount them on glass slides and coverslip the slides with Mowiol. View the stained slices either on a standard microscope with epifluorescence equipment or with a confocal microscope. Take images with an appropriate camera. For some images, invert the fluorescence contrast in order to yield darkly stained vessels on a bright background (Figures 5 and 6). Quantify the vessel density based on vessel crossings as described in Reference 8. Use slices stained for laminin for these measurements. Superimpose recorded images of 10X magnification with a 6 x 6 grid, where each grid is equal to 100 x 100 µm per square, total field of 0.25 mm2. Overlay three such grids in the CA1, CA3, DG, and EC region (Figure 2). Count the vessels crossing the lines of the grid. For obtaining results with a good statistical relevance, make measurements in at least 3 independent experiments, each including data from 3 mouse pups with 3 slices per mouse pup. Determine the average value of vessel crossings from the grids for each region and perform a statistical analysis by ANOVA with Bonferroni correction as post hoc test (p<0.05 defined as significant) using appropriate statistics software. Oxygen glucose deprivation and hypoxia induce neuronal death and blood vessel reduction specifically in the hippocampal CA1 region. OGD or oxygen-deprivation alone for 15 min induced a strong induction of cell death as seen by propidium iodide staining specifically in the CA1 area of the hippocampus (Figure 3) similar as described previously7. With markers to visualize the network of blood vessels, it was found that blood vessel density and organization appeared similar to the control after OGD challenge in most parts of the culture with the exception of the CA1 region. There the blood vessel density was decreased and the blood vessel network was partially disrupted (Figure 3, E and F). These changes were seen only in the area where the propidium iodide staining was increased. The time course of the vascular changes parallels that of neuronal degeneration. We have studied the time course of both neuronal degeneration and blood vessel loss in CA1 using time points at 3 hr, 24 hr and 48 hr after oxygen deprivation (hypoxia). At 3 hr post hypoxia, there was no propidium iodide staining visible and there were no changes present in the blood vessel architecture indicating that at this time no changes were visible yet (Figure 4, A and B). At 24 hr post hypoxia there was appearance of propidium iodide staining indicating the progression of cell death in CA1. At this time point the network of blood vessels was already disturbed and blood vessels were lost in the CA1 region (Figure 4, C and D). Both, propidium iodide staining and blood vessel loss became more pronounced at 48 hr post hypoxia (Figure 4, E and F). Both neuronal death and blood vessel loss are prevented by blocking excitation after OGD or hypoxia. When we combined OGD with pharmacological treatments that prevented excess glutamate release, it was possible to rescue neurons from OGD-induced cell death. Treatment with TTX (which inhibits action potential generation resulting in the silencing of afferent terminals) or treatment with CNQX (which inhibits AMPA-type glutamate receptors) rescued CA1 pyramidal cells from neuronal death (Figure 5, D and F). These results indicate that neuronal death after OGD is mediated by excitotoxic action of glutamate. After these treatments, not only neuronal cell death was prevented, but also the vessel integrity was preserved and the loss of blood vessels in CA1 was prevented (Figure 5, C and E). 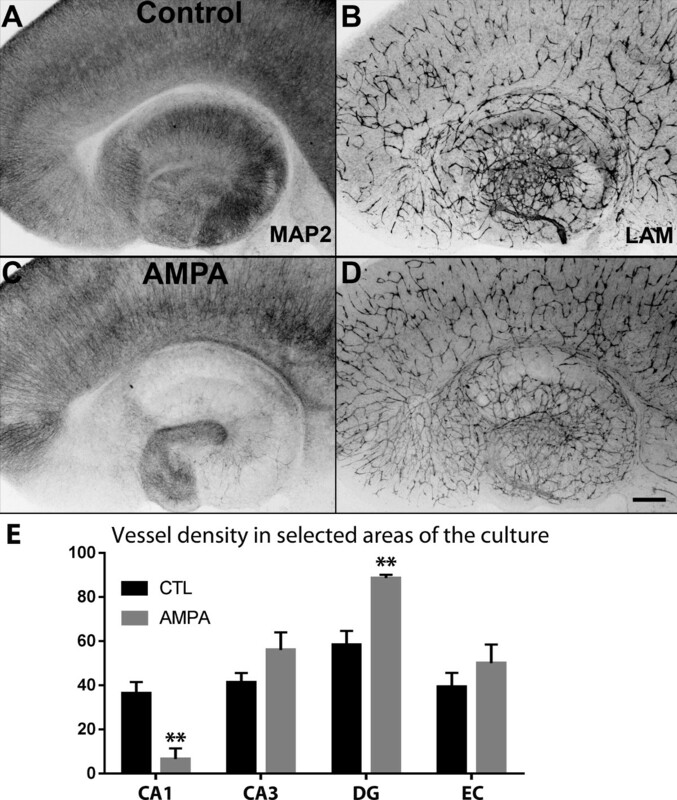 AMPA treatment induces widespread excitotoxic neuronal death in the hippocampus but vessel loss is restricted to CA1. OGD as used in this study induces neuronal death specifically in CA1. In contrast, treatment with 100 µM AMPA for 30 min induced a widespread neuronal loss in the entire cornu ammonis of the hippocampus (CA1 and CA3) and the subiculum but not in the dentate gyrus (Figure 6C). Interestingly, blood vessel loss was confined to the CA1 region, despite a similar neuronal loss in CA3 there was no blood vessel loss in this region (Figure 6D). In the dentate gyrus there was neither neuronal death nor blood vessel loss. The quantification of vessel density confirms that blood vessels are lost in CA1, but not in the other regions of the culture Figure 6E. Figure 1. Schedule of OGD exposure and reperfusion. After 5 days in vitro cultures are subjected to OGD, hypoxia or AMPA treatment. Cultures are fixed after a survival time of 3 hr, 24 hr and 48 hr. Figure 2. Quantification of blood vessel density in different regions of the entorhino-hippocampal slice cultures. Three 6 x 6 grids (here shown as squares) are overlaid in the CA1, CA3, DG, and EC region. The blood vessels crossing the internal lines of the grid were counted for each square. Figure 3. Hypoxia treatment induces neuronal death and blood vessel loss in CA1. (A, C, E) control cultures, (B, D, F) cultures subjected to hypoxia treatment followed by 48 hr of normoxia. Laminin immunostaining at low magnification in green (A, B), PI staining at higher magnification in red (C. D), merged images for laminin and PI staining in (E) and (F). Scale bars in (B for A, B) and (F for C, D, E, F) = 100 µm. Please click here to view a larger version of this figure. Figure 4. Time course of vascular changes and neuronal degeneration after oxygen deprivation (hypoxia). 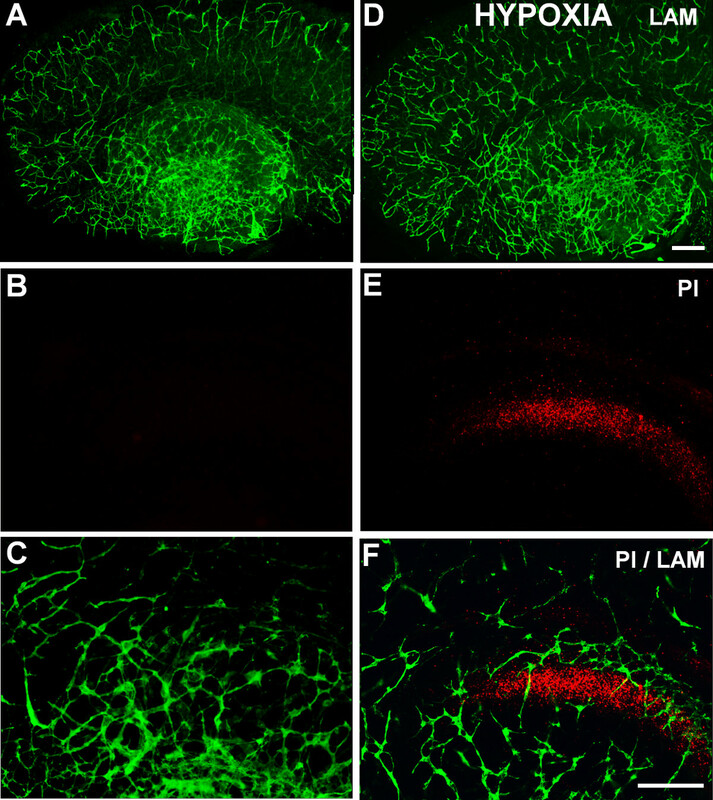 PI staining in red shown in (A, C, E), merged images for PI staining and laminin (green) shown in (B, D, F). At 3 hr post hypoxia treatment, there is no PI staining visible and no vascular changes are evident (A, B). After 24 hr PI staining emerges and blood vessel loss is also evident (C, D). Both PI staining and blood vessel loss become more evident after 48 hr (E, F). Scale bar in (F) = 100 µm. Please click here to view a larger version of this figure. Figure 5. Neuronal death and blood vessel loss are prevented by blockers of neuronal excitation. 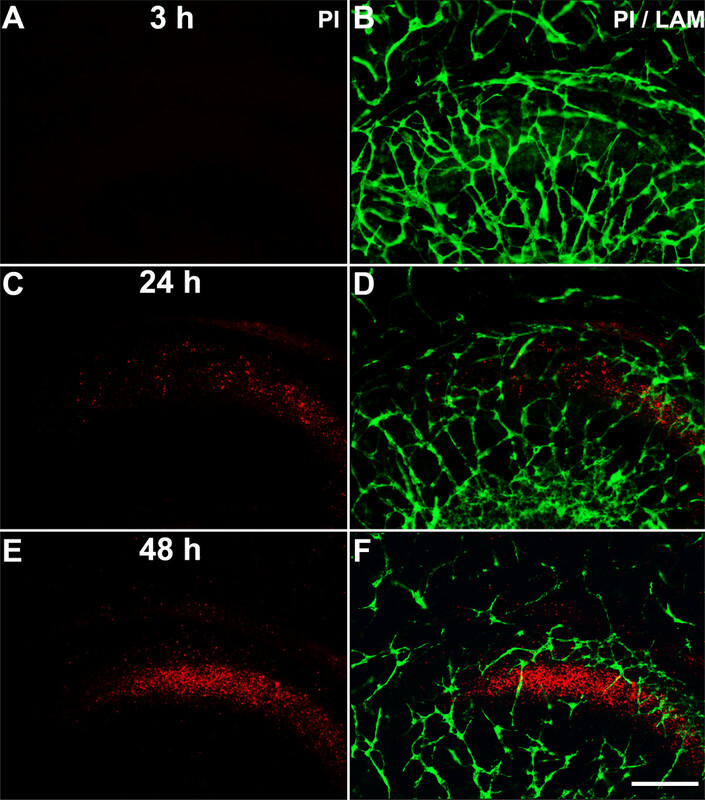 Application of either TTX (C, D) or CNQX (E, F) prevented both neuronal loss as seen with PI staining (B, D, F) and blood vessel loss revealed by laminin staining (A, C, E). 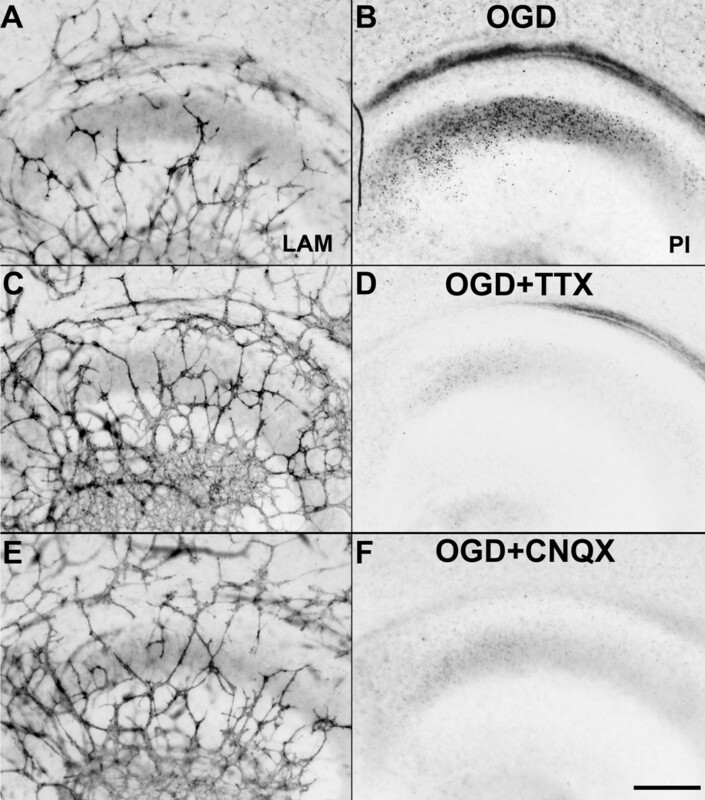 OGD alone induces both neuronal loss and loss of blood vessels in CA1 (A, B). Scale bar in (F) = 100 µm. Please click here to view a larger version of this figure. Figure 6. Neuronal death and blood vessel loss after AMPA treatment. Treatment with 100 µM AMPA for 30 min induced widespread neuronal loss in most areas of the hippocampus (C), but the loss of blood vessels remained restricted to area CA1 (D). Scale bar in (D) = 100 µm. The quantification of blood vessels confirms the selective loss in the CA1 area (E). Columns show the mean number of vessel crossings, error bars showing the SEM. Significant differences are indicated with ** for p<0.01. Results were derived from three independent experiments with three analyzed cultures each (n=9) for every region. Please click here to view a larger version of this figure. Table 1. Detailed time sequence of steps for OGD/hypoxia treatment. With the methods presented here, hippocampal organotypic slice cultures can be used as a versatile tool to study plastic changes in neural tissue after injury. While organotypic slice cultures have been used in the past for studying neuronal reactions after ischemia6, 7 the new aspect of the simultaneous study of vascular changes significantly enhances the potential applications of this method. The induction of OGD or hypoxia alone can be applied by rather simple means in organotypic slice cultures and leads to reliable and reproducible damage in the neural tissue. Furthermore, the slice culture approach allows not only studying the consequences of ischemic challenge but also allows for testing of potential therapeutic measures aimed at neuroprotection. Slice cultures therefore are an attractive and important tool for the study of ischemic brain injury. The method presented here is easy to implement for all laboratories having some experience with CNS slice cultures. Applying the OGD or hypoxia requires a careful equilibration of the culture medium with N2 in order to achieve reproducible results. It is also important to only use slice cultures with a low number of PI-positive cells prior to application of OGD. The conditions of hypoxia (i.e., the time for which hypoxia or OGD are applied) can be varied and optimized according to the type of slice culture used. While neuronal reactions to ischemia have been studied extensively there is only little information available about vascular changes after hypoxic-ischemic brain injury. The finding that blood vessels and even markers of the blood brain barrier are maintained in organotypic slice cultures for up to a week8, 9 has opened the opportunity to study changes of the vasculature after hypoxia challenge in the setting of hippocampal organotypic slice cultures10. Of course it needs to be realized that the vessels that are maintained in slice cultures are not perfused. Furthermore, we have observed differences in the loss of pre-existing blood-vessels rather than extensive formation of novel blood vessels. This model system is, therefore, probably not optimal for studying new vessel formation after an ischemic insult. The possibility to use organotypic hippocampal slice cultures for the further elucidation of the complex interaction between neurons and the vasculature opens a new field of study and promises to help achieving a better understanding of and developing new treatment options for neurovascular disorders, in particular cerebral ischemia after stroke. Animal experiments were carried out in accordance with the European Communities Council Directive of 24 November 1986 (86/609/EEC) and were reviewed and permitted by Swiss authorities. The authors have nothing to disclose. This work was supported by the University of Basel, Department of Biomedicine, and the Swiss National Science Foundation (31003A_141007). Markus Saxer provided technical support. Turner, R. C., Dodson, S. C., Rosen, C. L., Huber, J. D. The science of cerebral ischemia and the quest for neuroprotection: navigating past failure to future success. J Neurosurg. 118, 1072-1085 (2013). Bacigaluppi, M., Comi, G., Hermann, D. M. Animal models of ischemic stroke. Part two: modeling cerebral ischemia. Open Neurol J. 4, 34-38 (2010). Woodhams, P. L., Atkinson, D. J. Regeneration of entorhino-dentate projections in organotypic slice cultures: mode of axonal regrowth and effects of growth factors. Exp Neurol. 140, 68-78 (1996). Prang, P., Del Turco, D., Kapfhammer, J. P. Regeneration of entorhinal fibers in mouse slice cultures is age dependent and can be stimulated by NT-4, GDNF, and modulators of G-proteins and protein kinase. C. Exp Neurol. 169, 135-147 (2001). Bonnici, B., Kapfhammer, J. P. Spontaneous regeneration of intrinsic spinal cord axons in a novel spinal cord slice culture model. Eur J Neurosci. 27, 2483-2492 (2008). Laake, J. H., Haug, F. M., Wieloch, T., Ottersen, O. P. A simple in vitro model of ischemia based on hippocampal slice cultures and propidium iodide fluorescence. Brain Res Brain Res Protoc. 4, 173-184 (1999). Rytter, A., Cronberg, T., Asztély, F., Nemali, S., Wieloch, T. Mouse hippocampal organotypic tissue cultures exposed to in vitro ‘ischemia’ show selective and delayed CA1 damage that is aggravated by glucose. J Cereb Blood Flow Metab. 23, 23-33 (2003). Bendfeldt, K., Radojevic, V., Kapfhammer, J., Nitsch, C. Basic fibroblast growth factor modulates density of blood vessels and preserves tight junctions in organotypic cortical cultures of mice: a new in vitro model of the blood-brain barrier. J Neurosci. 27, 3260-3267 (2007). Camenzind, R. S., et al. Preservation of transendothelial glucose transporter 1 and P-glycoprotein transporters in a cortical slice culture model of the blood-brain barrier. Neuroscience. 170, 361-371 (2010). De Jong, G. I., et al. Cerebral hypoperfusion yields capillary damage in the hippocampal CA1 area that correlates with spatial memory impairment. Neuroscience. 91, 203-210 (1999). Cavaglia, M., et al. Regional variation in brain capillary density and vascular response to ischemia. Brain Res. 910, 81-93 (2001). Chip, S., Nitsch, C., Wellmann, S., Kapfhammer, J. P. Subfield-specific neurovascular remodeling in the entorhino-hippocampal-organotypic slice culture as a response to oxygen-glucose deprivation and excitotoxic cell death. J Cereb Blood Flow Metab. 33, 508-518 (2013). Stoppini, L., Buchs, P. A., Muller, D. A simple method for organotypic cultures of nervous tissue. J Neurosci Methods. 37, 173-182 (1991). Hello, if you have a chance then I recommend to try to maintain organotypic slices in 5% CO2 and 12%O2. In my preliminary experiments I got a strong development of the vascular system in organotypic cultures.